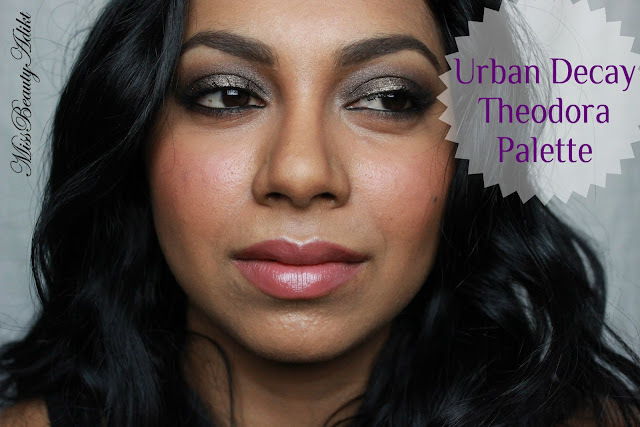 I love all Urban Decay palettes and the new Theodora palette* was one i was eager to try. The palette comes with four full size eyeshadows and two duo eyeshadows. All these shades are brand new. It also comes with an 24/7 pencil in zero and a High Gloss Lip Colour in Theodora, which is a bright cherry red. There is quite a variety of colours in this palette, which gives the flexibility to be able to create whichever look you wanted. I like the packaging because it seems much more sturdier, than some of the other palettes i have seen on the market. Plus, there is a huge mirror inside the palette. The palette certainly does have more neutral colours, however the duos allow you to mix and match the shades or even accent the eyeshadows. Bewitch -Taupey, dark shimmery brown. Left-Right: Broken, Beware, Bewitch, West, Spell, Jealous. As you can see the eyeshadows are very pigmented and still work well on my dark skin tone. The eyeshadows applied very smoothly without any fallout. I am always happy with Urban Decay eyeshadows and this palette hasn't disappointed me. I used this palette to recreate the Beyonce makeup from her performance at the Super Bowl and the colours were very close to what she wore on her eyes. This is great for all skin tones and is amazing value for money, as you are getting six full eyeshadows, 24/7 eyeliner and a High Gloss Lip Colour, all for £35! It is a limited edition product, that can be found in Debenhams and House of Fraser. I love this palette as well. I'm an urban decay junkie! I have the glinda palette as well. I enjoy both but theodora more since the colors are more suited for my skin. I found it to be a little on the light side, with only a few categories… but all of that quickly changed when I clicked, and found deals that felt more like steals! Hi selina, just wanted to ask you is the lip colour definitely part of the Theodora palette? Reason is, there is a seller on eBay advertising the palette as 'new and unopened' but Without the lip colour.